Breeders were encouraged to dress and create booths that reflected their pet's heritage at the Meet the Breeds event in New York City last weekend, where more than 160 dog breeds and 40 cats were on display to educate the public about how to pick a species and breed. 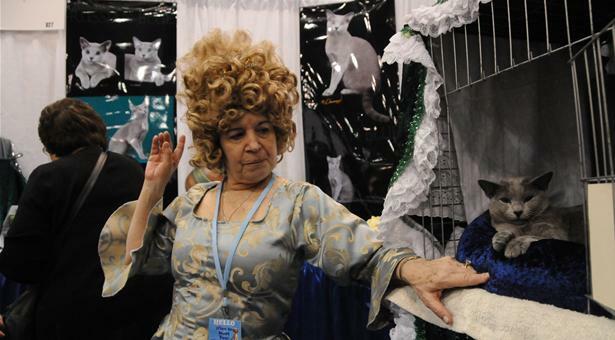 Above, Jane Ramey of Port Washington, N.Y., dressed in a period Russian costume with her Russian Blue cat Czar Nicholas. USA Today's Paw Print Post columnist highlights Uno's appearance at the event, a joint venture of the American Kennel Club and the Cat Fanciers' Association. "One that will stick with me: the crowds of kids and parents who rushed to meet Uno, one of the most popular dogs in America." Uno is featured in this video that shows many of the sights and -- ruff ruff, meow -- sounds from the weekend.